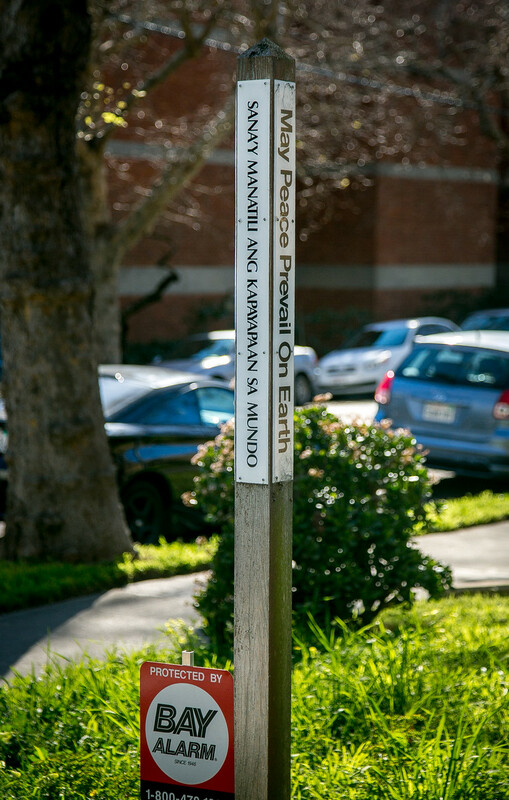 Peace poles, the mass-produced ones distributed by the World Peace Prayer Society, proclaim “May Peace Prevail on Earth” in many different languages. You pick the four languages you want. 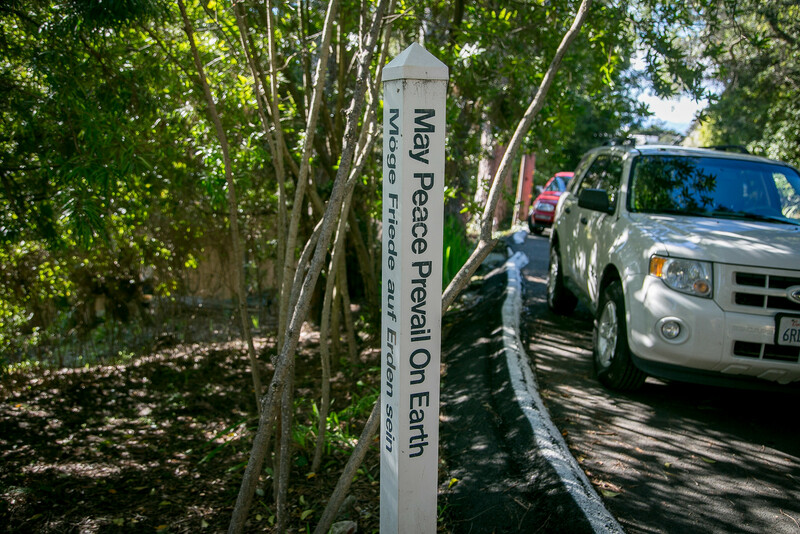 The World Peace Prayer Society estimates that there are 200,000 worldwide. There are a few in Berkeley. 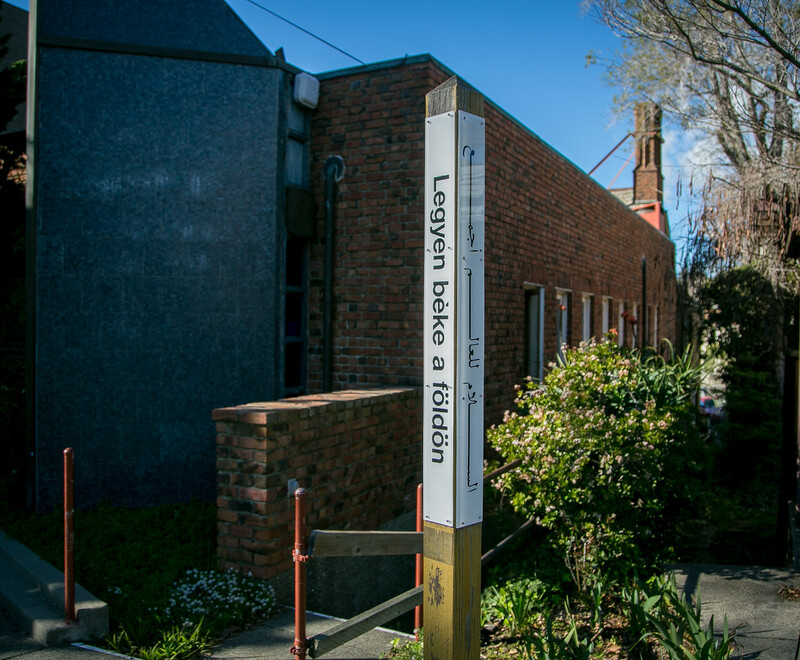 The first peace pole that I knew was at 1118 Oxford Street. 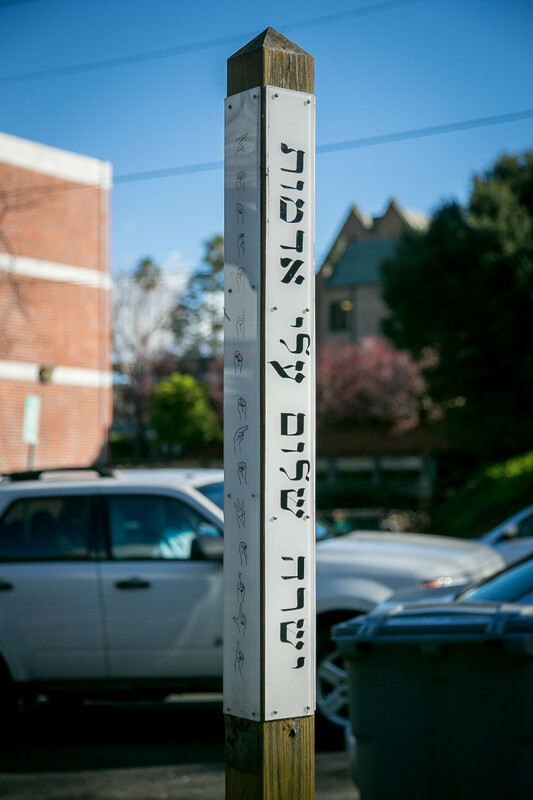 Rick Perlman and Pam Erenberg installed it in the early 1980s. It came with several small bags of Ready Mix concrete. 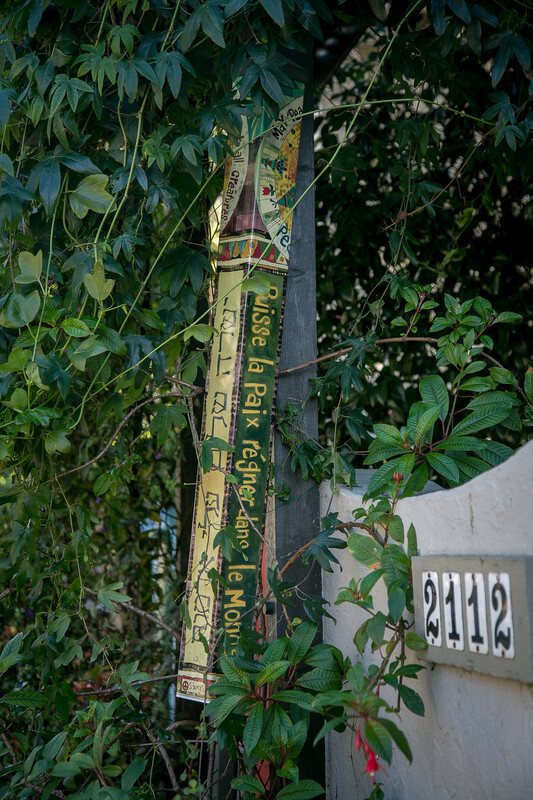 When they moved from Oxford Street to San Antonio Street they took the peace pole with them. Here they had to provide their own concrete. 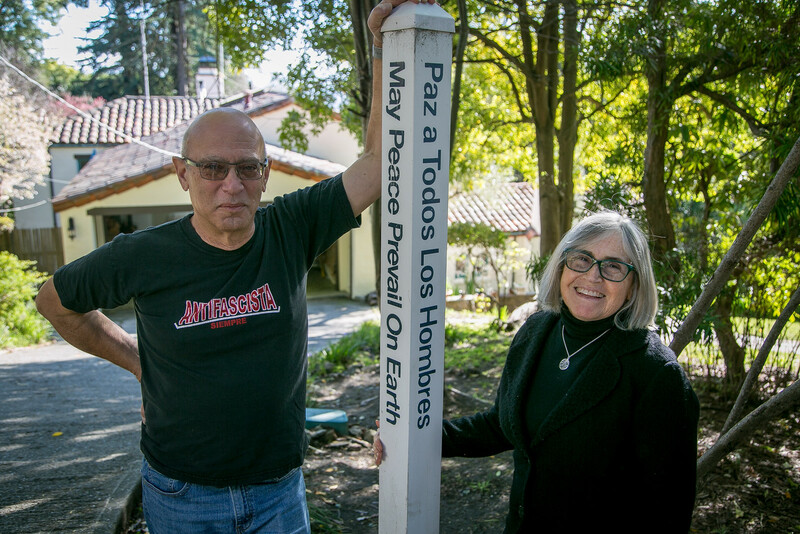 Both were peace activists in the 1960s. Perlman’s father fought with the Abraham Lincoln Brigade in the Spanish Civil War, and his mother was a committed leftist. Note his “Anti-Facista” t-shirt. 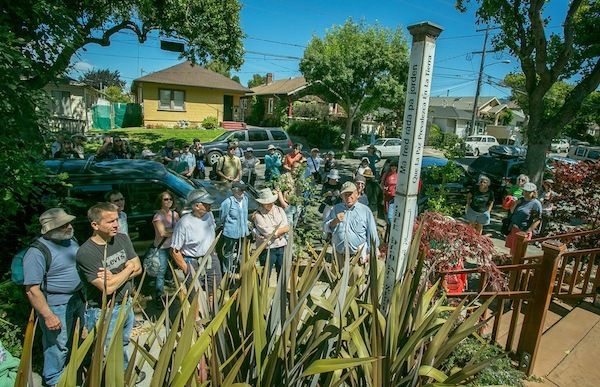 This photo is from my first Quirky Berkeley walk for the Berkeley Path Wanderers in August 2013. 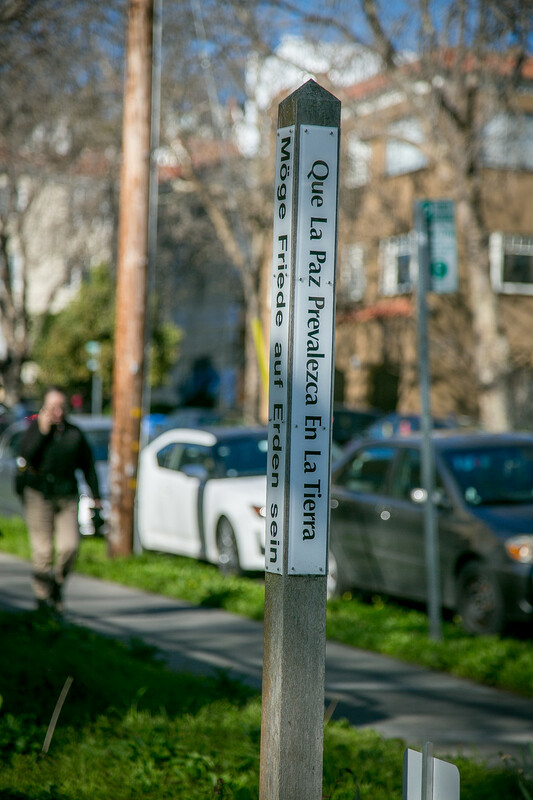 Then there are the peace poles installed by institutions. 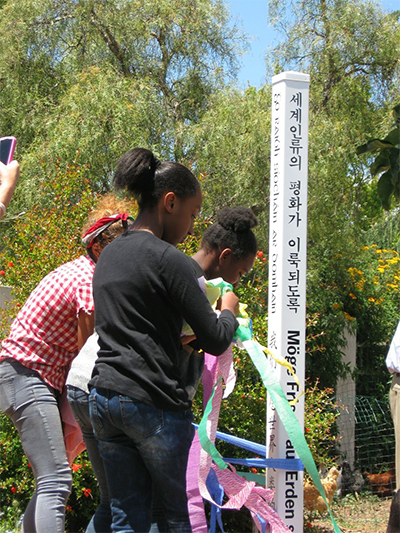 In 2013, students at Willard planted a peace pole. 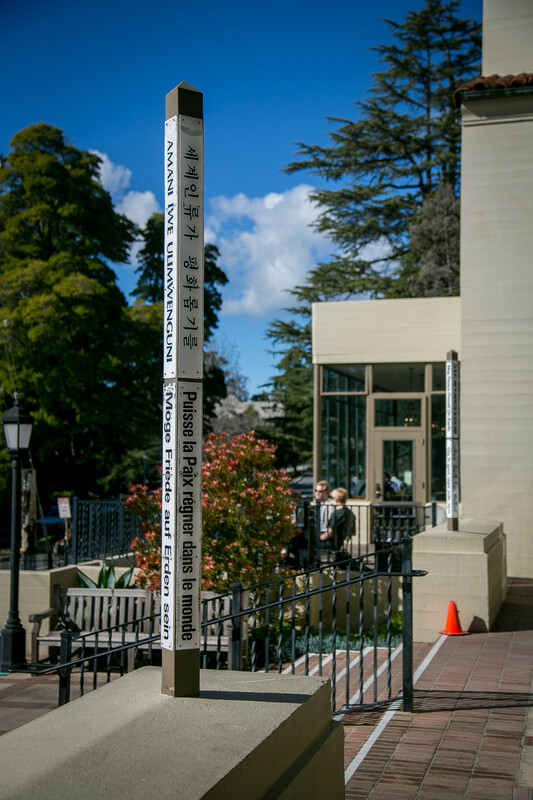 The story about the pole is found at the World Peace Prayer Society website. 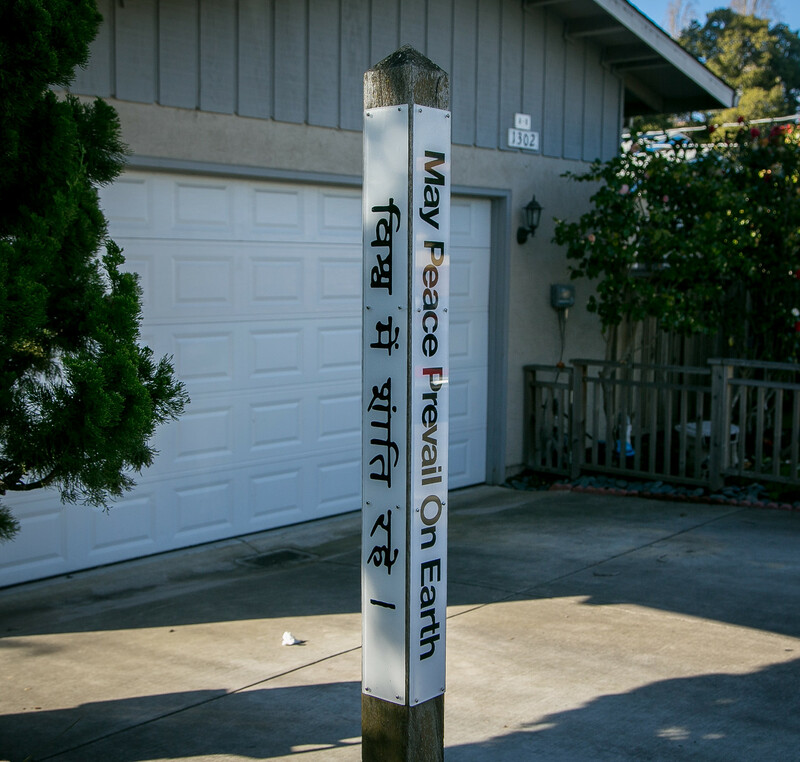 They are a few at the entrance of the International House, 2299 Piedmont. Each has eight languages instead of the customary four. 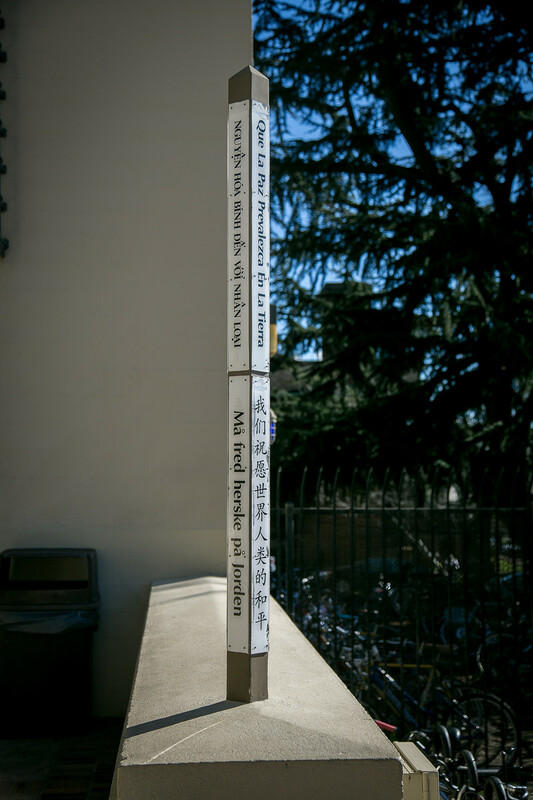 I found two amidst the schools at the Graduate Theology Union / God Hill. 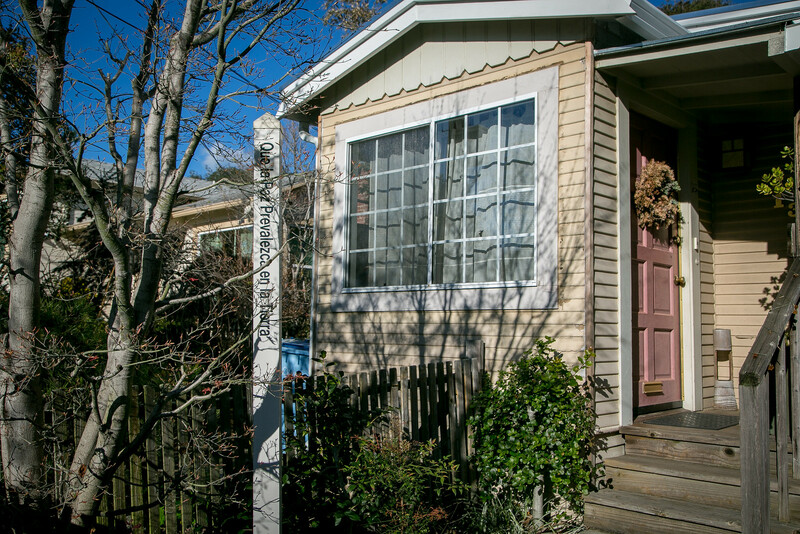 About at block away, at 2441 Le Conte, is the Universalist Unitarian Starr King School for the Ministry, a mouthful. 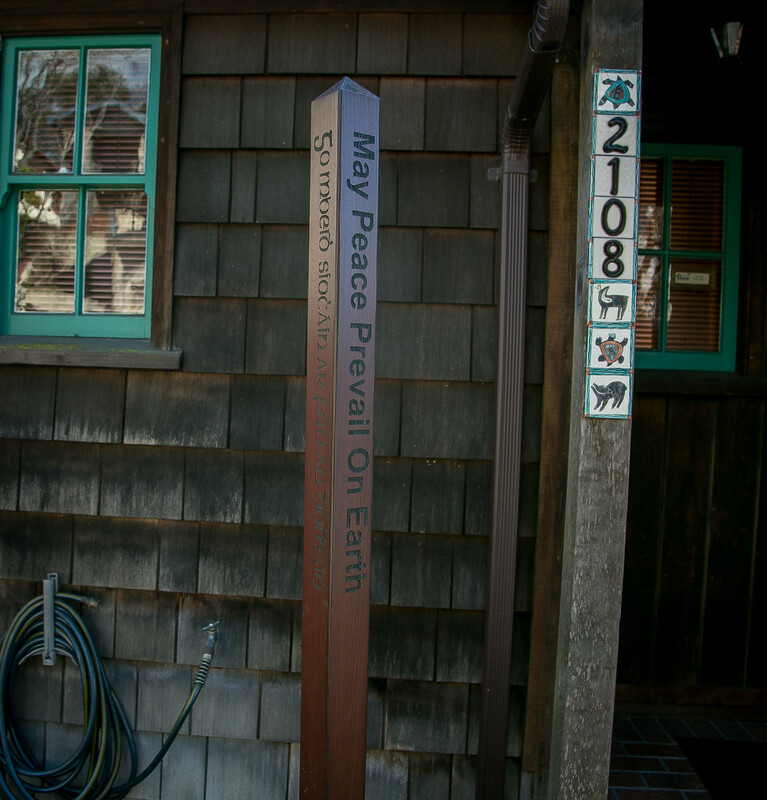 A sweet, modest little peace pole sits in a flower bed, but its inclusion of American Sign Language signing for “May Peace Prevail on Earth” takes the cake. Be that a it may, peace prevailing is a good sentiment. I want peace. Sometimes I feel peace, fleetingly with gusts into sustained. I want more. I want that peace train, getting nearer. 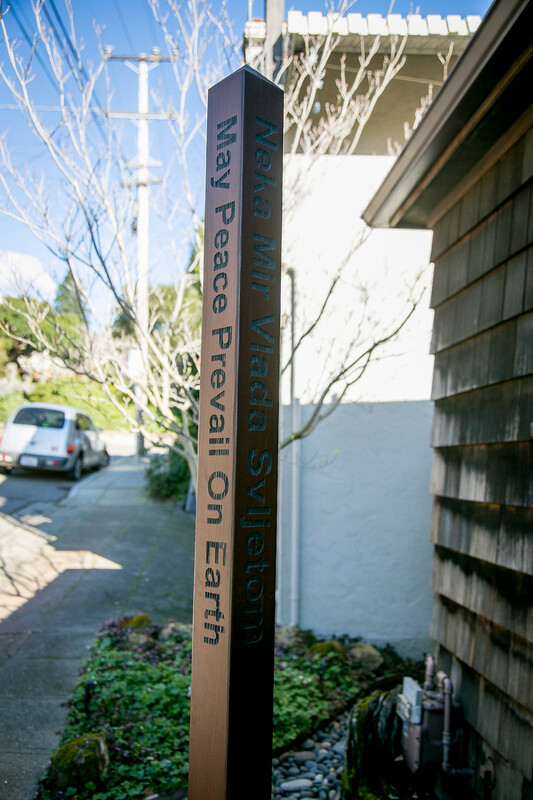 Back to my friend – what of this post and the peace poles? Posted in Uncategorized. 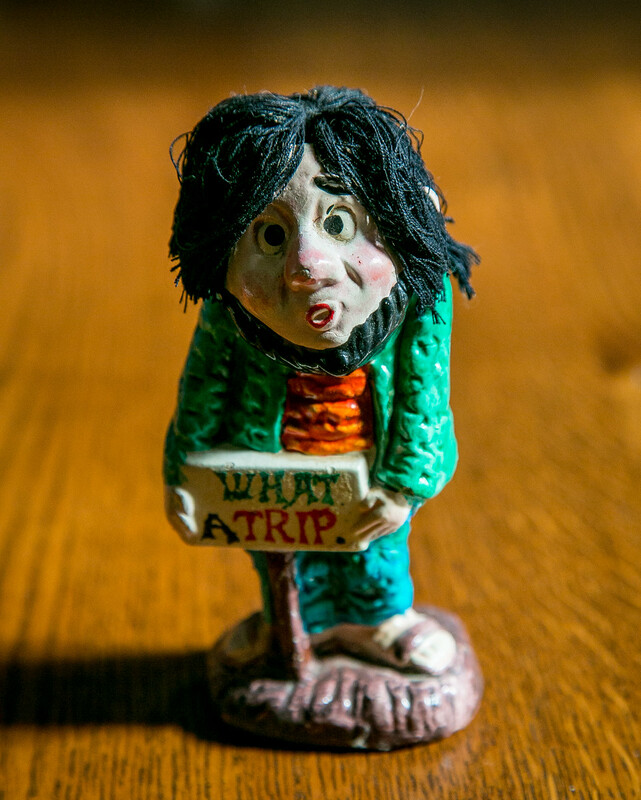 RSS 2.0 feed. 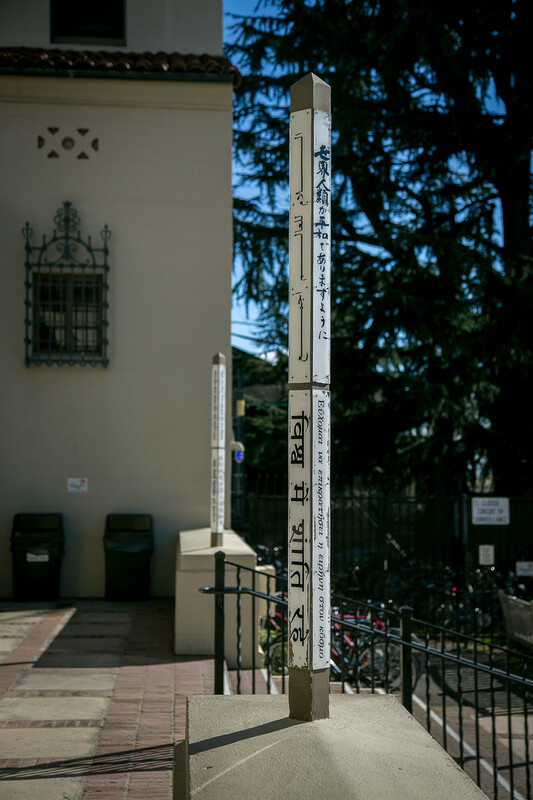 Here you will find photos of the oddball, whimsical, eccentric, and the near-rhyme quirky material culture of Berkeley.